Yesterday I wrote https://emotionalpeace.wordpress.com/2017/07/30/knocked-down-but-back-up-again/comment-page-1/#comment-2521 Knocked down but back up again. Well since then I have come down with a stomach bug, came home from getting a Sprite to calm my stomach only to spill it all over my living room floor. When I went to get a mop to clean it up I slipped and fell landing face first hurting my knee and wrist which was finally feeling better from a fall I took a couple of weeks ago when I got tripped by a dog. Q: What do you do when you fall and no one is there to help you up? To be honest when I fell I cried and yelled at first, but there was no one but me to clean up the spilled soda, so I had no choice but to make myself get up and mop up the mess. I then got some ice packs and and laid on the couch. One of my fears is that one day I will fall and not be able to make myself get up and since I live alone I wonder how long will I lay on the floor till help comes. For me it could be days since I do not get frequent visitors. My concern is not for me alone. I work as a home caregiver now and my job is to not only cook and clean for my clients but companionship and to be able to call for medical help if there is a need. I have had clients who have wonderful families who check on them on a regular basis but I have also had clients that have no one. These are the ones my heart has empathy for since I know what it is like to be alone and not in the greatest health. A friend of mine asked her pastor once if the church did anything for the the home bound people in the area and he replied no because if they wanted to hear the Word they would find a way to make it to church. She pointed out that if they made cds of the sermons these people would appreciate being able to hear the message and feel cared for. He did not agree. I often take a meal to any of my neighbors knowing how nice it is to just to be thought of or picked a flower and gave it to them just to brighten their day. It is not much and I am limited in what I can do but I do this because I know what it feels like to be not only alone but to feel lonely and unimportant at times. Yesterday my next door neighbor knowing I didn’t feel well brought me flowers from her flower bed and I am thankful for her thoughtfulness. Sometimes we will get knocked down and are not able to immediately get back up. It hurts and can be terrifying. We can lay there while fear overcomes us and we drown in loneliness. The other option is to breathe and take moment to clear your thoughts. Being afraid is not going to get you back up and you might be alone without physical help but Jesus is always with you even when you are fallen. It hurt like hell getting up after I fell and mopping up the mess did not make any part of me feel better, but this time I got up. I wasn’t happy and a few colorful words did escape my mouth as I cleaned up the mess and yes now I am resting giving my body a chance to heal up but tomorrow will come and I will get back up and do it allover again. Hopefully without falling or being sick. i have to hold on to hope and not give into fear and trust no matter how bad it gets God is always for me. Pain is unavoidable and is an unpleasant part of life. If I were to say that I enjoyed pain you would know something is wrong with me. I hate pain, it hurts! So what do you when you feel pain? How do you react when someone hurts you? To be honest when I am hurt I my first thought is not to be kind. I would like to hit the person who hit me back. Yet Jesus tells us to turn and offer the other cheek. (Luke 6:29 If someone strikes you on one cheek,turn to him the other also. And if someone takes your cloak, do not withhold your tunic as well. ) No matter how many times I read this verse I still say, “Really?” Yet then I also remember visiting a dojo, and watched a sensei do a demonstration. He stood with a gentle smile on his face while a student proceeded to strike him repetitively on both cheeks. His expression never changed no matter how many times he was struck, he just stood there smiling. I was on the opposite side of the large room and could hear the sound of each hit, and I could see the red marks left on his cheeks. At the end of the demonstration he simply said, “We are to do no harm. Just because you are hit does not mean that you must react. To hurt the one who is attacking you is to do harm. Taking time to determine if the attack is truly threatening and evaluating your response is important.” He was not teaching that his students become punching bags, but to not react in anger. Pain can lead to anger quickly. Scripture tells us to be slow to anger and that a gentle answer turns away wrath. (James 1:19 My beloved brothers, understand this: Everyone should be quick to listen, slow to speak, and slow to anger,/Proverbs 15:1 A gentle answer turns away wrath, But a harsh word stirs up anger.) So then the next time you are hurt take a moment and think what is your best reaction. Just because we are in pain does not mean we are allowed to cause pain in return. (Genesis 31:29 I have the power to harm you; but last night the God of your father said to me, ‘Be careful not to say anything to Jacob, either good or bad.’) Every day some one or thing may hurt you, and the pain you feel will make you feel bad. Yet even while in pain you can choose to do the right thing no matter how much it may hurt. Think about the story of Job and how much pain he went through. Pain of losing children, his health and his wealth. Yet even when criticized and told to curse God and die he remained faithful to God. When he made it through all this tragedy he went a step further. God was going to deal with his friends who basically kicked him while he was down. Yet Job interceded for them and saved their lives. He is a better man than I am(okay I am a woman, but you get my meaning). His example inspires me to do better and to ask God to help me to become a more gentle person who does not have to act in anger just because I am in pain. When was the last time you truly took the time to relax? With all of my health issues I am laid up quite frequently but this does not mean that I am really resting and I definitely do not feel relaxed. I may not be working physically but my mind is working over time. It acts more like Martha than Mary. All it does it looks at all the work that needs to be done. So as I am laid up my eyes focus on the things that need to be done around my home. I look at the clutter and the pile of bills and worry. Not very productive. About a month ago I came across an article on sleep. It talked about it is the quality of sleep the body needs and not the quantity. That a person could sleep eight hours or more and still feel exhausted because it was not truly rested. I do a lot of breathing exercises for various health reasons yet if I don’t reign my thoughts in it does not help as much as it could. Worrying about anything produces nothing but anxiety and more things to worry about. All of this robs me of the rest and relaxation my body needs. God declared a command for a Sabbath rest. Who better than the Creator know what our body needs. He gave us six days to labor and the seventh for rest. In Psalm 23 He leads us to still waters and green pastures. We need to learn to relax, sit still, calm our minds, shut out the world and all of its’ problems and just relax and rest in the presence of our Lord. He gives us true peace. We will not find peace in the world. It is only found in Him. Relax and breathe Him in. Rest in Him. The bills and work will still be there to deal with but staying focused only on your problems and the demands others and yourself have placed on you will only drain you and leave you frustrated. Turning your focus to Him will calm your mind and give peace to your body. He loves you and care for all of your needs. So relax and know that even if things may look dark and troubled you will be okay. The Light will drive away the darkness and you will see more clearly. Take a deep slow breath, hold it for 4-8 seconds and then breath out completely emptying your lungs. You may do this in a seated or laying down position. Repeat 8 times. While doing this focus your thoughts on the love God has for you and meditate on His Words of peace and rest. Let the tension in your body go as you let go of your worries and your stress. Repeating scriptures out loud until you find your body truly at peace. Have you ever been at the beach and stood in the water as you watched the waves rolling in? I remember walking out into the water as the waves came crashing upon me. I wasn’t afraid. 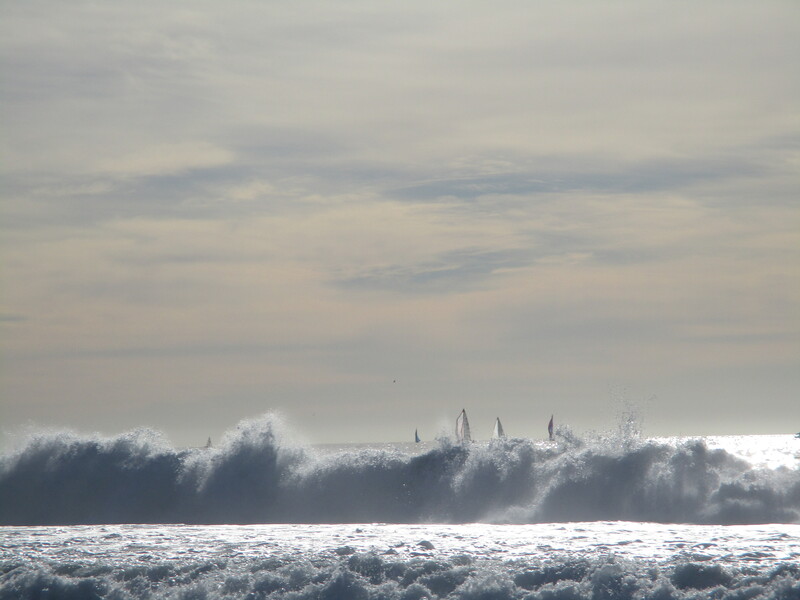 The bigger the wave the more exhilarated I felt when it would slam into me. Some even pushed me back up on to the shore. some of the waves even stung as they came down on me. When I had enough I would walk out of the ocean and sit on the sand and continue to watch the waves come rolling in. I was happy and at peace. Unfortunately I do not face the storms in my life in the same manner. I see the trouble and panic. The girl who could stand in the ocean and brace herself as the ocean slammed against her wave after wave disappears when problems arise in her life. No longer planted firmly on the ground, I get tossed around with every wave of trouble that hits me. Something is wrong with this picture. How can I face an ocean wave and feel joy, when that wave could easily carry me off and drown me, but become terrified because of someone or something brings trouble to my life or worse I get myself into trouble without anyone’s help. 2 Count it all joy, my brothers,[a] when you meet trials of various kinds, 3 for you know that the testing of your faith produces steadfastness. These are just two scriptures on joy,peace and tribulations. There are many more, but I will let you search for those yourself. I list these verses to show how one can have peace and even joy when the world slams against you like an ocean wave. I shared with you how the ocean waves did not steal my peace or joy, even when I saw waves that towered way above my head come crashing down on me. Then on the flip side I shared how the tribulations I face in this world terrify me and unsettle me. Yet in my mind I know I should be able to face the trials and tribulations in my life in the same manner I face the ocean waves. I need to look at the problems coming at me no matter how big they may seem like those waves. Being assured that after they hit I will still be okay, and even peaceful and filled with joy. I need to be able to stand on God’s Word and not fear what ever may come against me. David as a boy defeated Goliath, and Gideon led men into battle with only torches, clay pots and a trumpet and God gave him the victory without even having to fight. If God did this for them will He not do the same for me and you, especially since He sent His son to pay the price for our sins. Jesus redeemed us with His blood, and he would not have done this if He did not plan for us to live victorious, free from fear and doubt. I can no longer be double minded tossed around every time trouble comes at me. I must keep my eyes upon Jesus and trust He will not let me drown in my distress.